Gallery is created. Details to be added shortly. I've never participated in this contest, so I have some logistics questions. How does the gallery work? How do you post an image to it? Are you supposed to post your contest entry to the gallery and not this thread? Thanks for any clarification you can provide to new participants. I feel really bad that you didn't know! They have changed for the worse, yes. It's a monthly coupon that you have to use all at once. And be sure to have something worth at least $6 in your cart that is a DAZ Original (not a PC item). No more applying them towards the PA items. And if you get something that's only $5, you lose the other $1. Of course, there aren't many things that are less than $6 in here lately anyway. I am sorry Dana, but no, it was not gift certs, it was vouchers that Daz gave when they sponsored contests., Not just for this challenge, but for all Daz sponsored Contests. This was why they have been discontinued since the New site went live. Gift Certs were only used as prizes when the host for that month added them as a prize. First off, can I say Welcome to the Freebie CHallenge. The host for the Month, or Kendall or Alexa update the Gallery. When the Gallery is updated a link will be posted to it, so people can go to it. Entries are posted into this thread, together with working links to all the freebies you have used. Once your entry is accepted as having been done according to the rules, then it will be copied to the gallery. Thanks, chohole, I think that is what I needed to know. I'll look at the rules and see if I can join in. jeeperz you just well ok? We can wait. Health comes first and for most. I hope that you are drinking a lot of water. We don't want you to have the same mishap as Mrs. Clinton. Now that is a horror story, concussions and blood clots in the brain. Got to worry about brain damage. No, no, we don't want you trying to do something when you aren't ready. Well that sux! So why don't I know about this, I check every avenue of things going on here at this site. I don't check my email for things from Daz because I get hundreds of things from here. Everyday there are just tons of junk advertisements from here, so the notifications must have gotten lost in the shuffle of them all. I don't open and read them all, no time for that, so I just delete them. That in itself sux that Daz can't control all the garbage they send out to where actual beneficial stuff can be found. I would have certainly used this because I buy a lot of stuff from the Daz store, including Daz originals. I feel I should know about this. It would have made a difference in how much I bought for sure. I have this same problem every month. I have to use the delete image feature, then save it, go to a page and see if the image is gone. Sign off the site completely, do a BROWSER WASH then sign back on. Then apply the banner image in a different format. I rotate between .jpg and .gif each month. Then after the image is applied, save again, then go see if it took. That's how I have to do it. I've never gotten junk advertising from DAZ (unless you consider a sales alert junk advertising). I get at the most 4 notifications from DAZ3D a week (aside from the forum notifications). If you are getting junk mail; it's most likely not from DAZ. I agree with BWSman on that point. I have just checked my in box, and have only 6 emalis from DAZ so far this year, (if you don't count ebots and PM notifications) and one of those was the PC newsletter with the PC coupon code in it, and one was a mail with another, one day only coupon. If you notice, my Avatar is gone now. I tried to change it and it will not take anything I try to put up...no format, and it won't even take the one I was using back! So, I join LG in this. And yes, I have loaded avatars now for 12 years, so I know how to size them and do it. It must be a glitch. Yes, I call advertising junk email. It may not be that to some, but I don't read it or use it. I get a lot of it. Most of it is alerts that I have gotten a comment here or at Facebook. I just deleted 325 of them a few minutes ago. All from Facebook and here. It is easy to miss one that may be something important. In any case, it was eating up all of the allocated bandwidth for the gallery. I've put a throttle on the server to try to stop it. Any of you on that provider, I'm sorry but for the next few days or so, you're not going to be able to get to the gallery with any speed at all. I'm hoping to not have to just block all of that provider's IP's to stop this. I hope that this improves the gallery's experience for everyone else. And WHAT, I hesitate to ask, might someone who is using Deutsche Telekom AG be doing with all our renders? I think this is the other side of the issue we need to explore. Now, these thieves might not necessarily be German, so there's no point MENTIONING THE WAR, but it's a safe bet that all of our hard work has been harvested for some nefarious EURO ZONE PLOT. And I'm reasonably sure it's not just one of those German software websites collecting pictures to give away in next December's advent calendar. I'm thinking it's more like some tiny little DAZ wannabe start-up in Lichtenstein or someplace like that. Maybe our images will be used as promotional material. Or perhaps some SOCIALIST PERVERTS want to "use" Da Real Man to undermine western democracy as decadent, especially now that Da Real Man has begun cross-dressing. Well of course, especially having seen Da real Man in the Summer fun and Pinups challenge, it could just be someone wanting to find images for an alternative pin-up calender. It goes back to rule 34 of the internet. No matter what it is, some sick perv will turn it into p0rn. Bah! All your links are fine. Entry accepted. 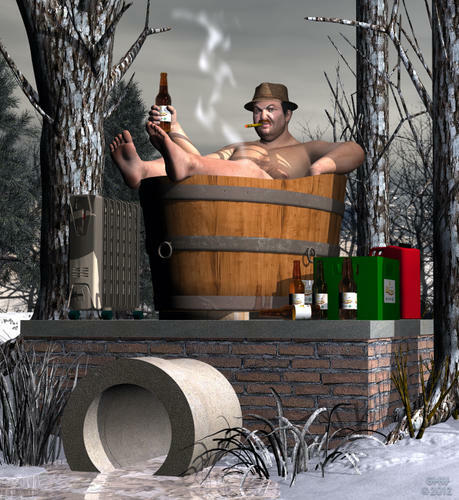 They could start a war with Da Real Man in the hot tub render! HEY, HEY, HEY!!! Waddahell everybody pickin' on me for? I didn't do nuttin'! I don't know nuttin' 'bout no Goimans stealin' no bands! Alla da Goimans in my neighborhood steals da milk offa da stoop in th' mornin' 'cause dey is too cheap t' buy dere own. Sheesh! Go steal a cow f'goshs sake. 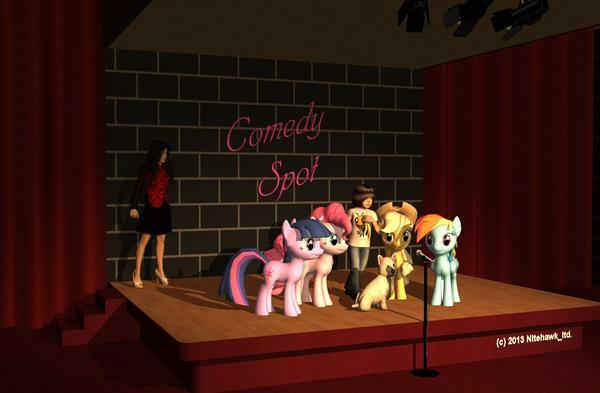 An' about dat crossdressin' t'ing, I t'ough we agreed, what happens in da forums stays in da forums! I thought that giving one or two of them in the first post might open it up a bit. I'm having a similar glitch, except that it's with my signature image instead of my avatar. Off to a good start I see. And I agree with Chohole about the theme, try to think out side the box a bit with this one. It is pretty open ended just for that reason. To give you the chance to do something a little different for the month. @Music & Others: I'm in the Same boat, Nothing uploads in my Control Panel. I needz the Banner so bad. Glad it's reported. @Lord Ganthor: We can't keep it in the forums if it's stolen and posted else where. Wasn't us really! I was thinking of entering this contest...then a few days ago my son's computer decided it's had enough of us. The graphics card and I think the power supply as well, decided to burn out. I am stuck on a little P4 computer, not even sure this old thing can handle Daz 1.7 which it what I use to use on a P II and P3 long ago. I am trying to find a downloadable 1.7 but no luck so far, every link leads to the current version of Daz and when I check my account, all the old versions I got are no longer there. Fortunately I saved the Anniversary Edition of Paint Shop Pro 7 and figured I could at least brush up my no longer used 2D graphic skills and still create. What I need to know is if a 2D image is allowed for this contest or is that reserved only for 3D images. If it's a problem with regards to the freebies that must be listed, I can take care of that. There are lots of free plugins for 2D graphic programs, and in relation to using numerous images to create one (photo manipulation) there are lots of free images, as well as my own images I create or use a camera for ( I can upload my images somewhere with links to offer for free), so having a freebie list for others to grab would not be a problem and would meet the required number you specify. So would such an image be allowed for this contest? Sorry; we only allow 3D images with little postwork. The first freebie challenge was limited to DS only (a free program) and only allowed free models; textures/shaders and poses to be used. The rules have since been relaxed to allow Poser & Bryce; but we don't allow extensive work in a 2D program to enhance the final image.